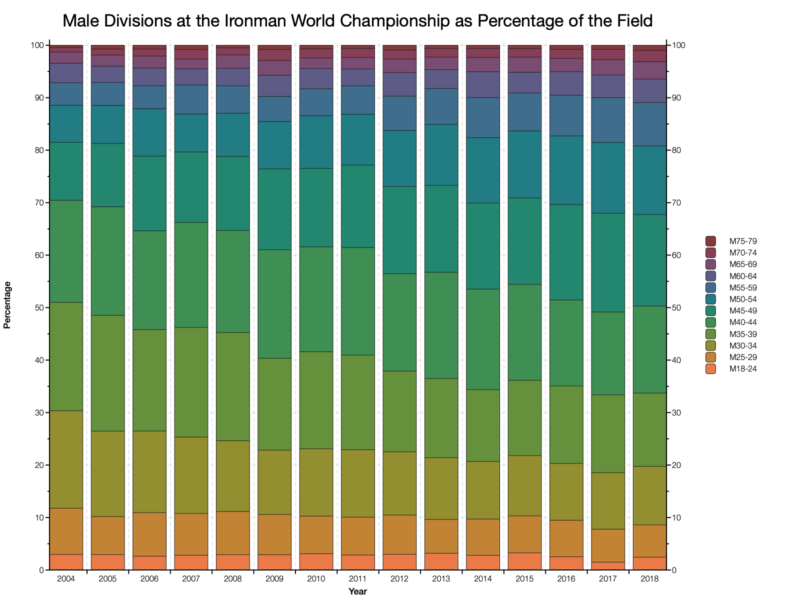 Who races at the Ironman World Champs? 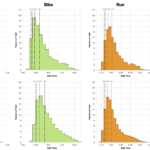 Most of my Ironman analyses focus on times and performances in the age group ranks. For a change of pace I’m going to look at the demographics of Kona. Breaking down the numbers to consider gender, age and nationalities and how that has changed over the last 15 years. If you’re more interested in how to get there, you might want to look at my Kona qualification page. Otherwise, prepare for a lot of colourful graphs and charts. 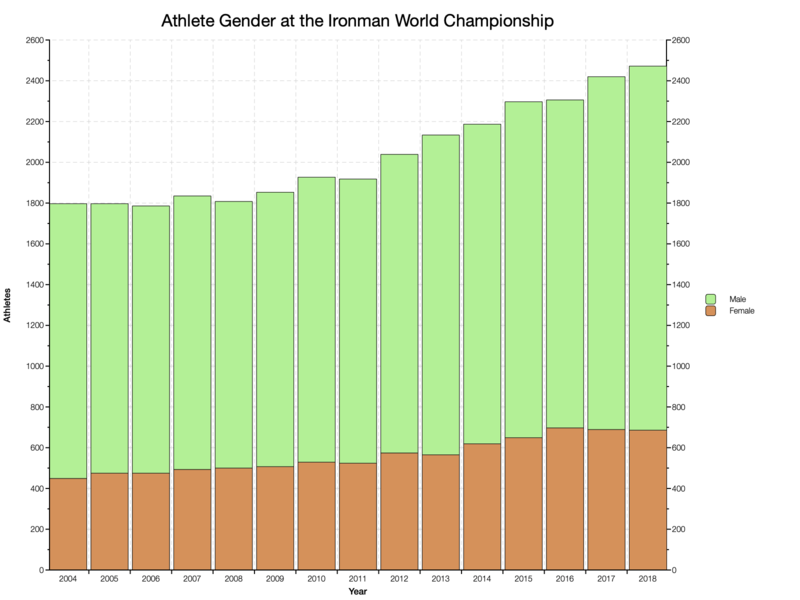 The chart above shows the gender of competitors over the last 15 years in Kona. Since 2010 the number of competitors at the World Championship has grown. What this graph highlight is that most of that growth has been on the male side. 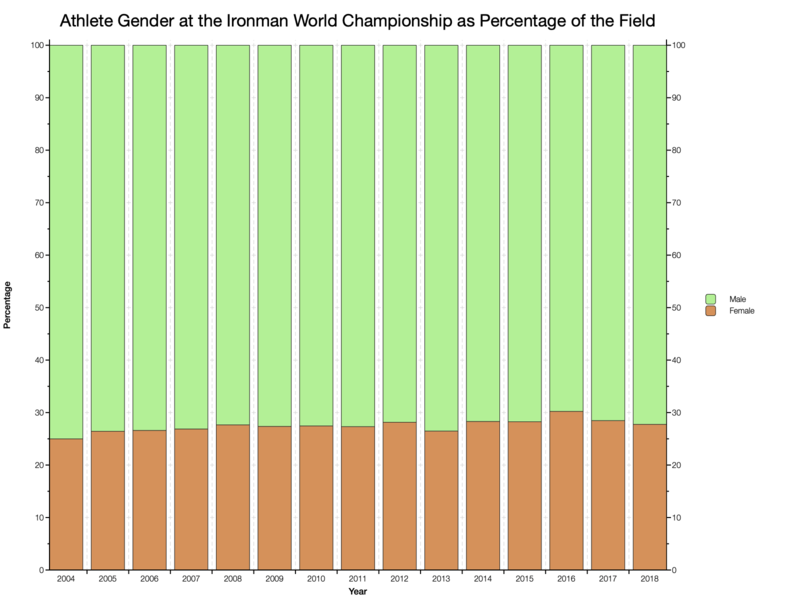 The women’s field has grown, although not in the last 3 years, but the numbers are bigger for men. If we switch the comparison to percentage of the field, the difference in annual numbers levels off. 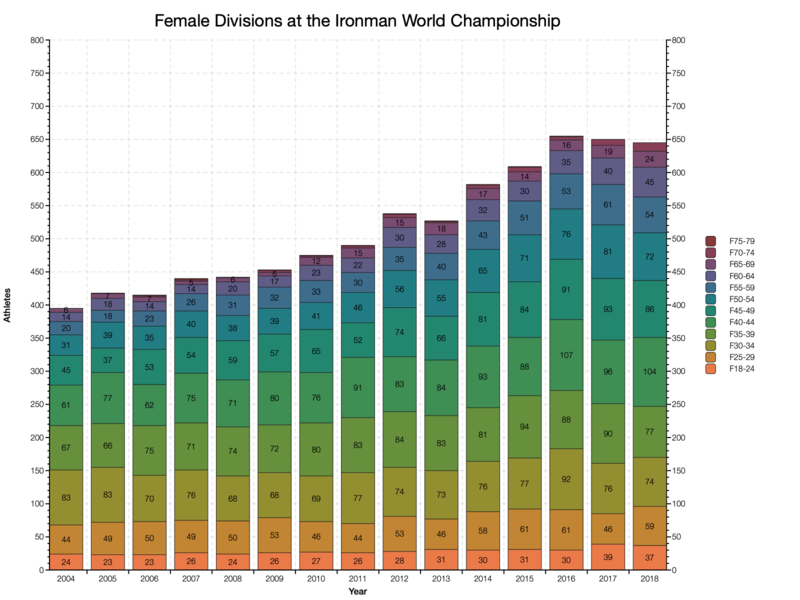 Between 25% and – at its peak in 2016 – 30% of the athletes in Kona have been women. In the last 5 years they’ve made up around 28% of the field. 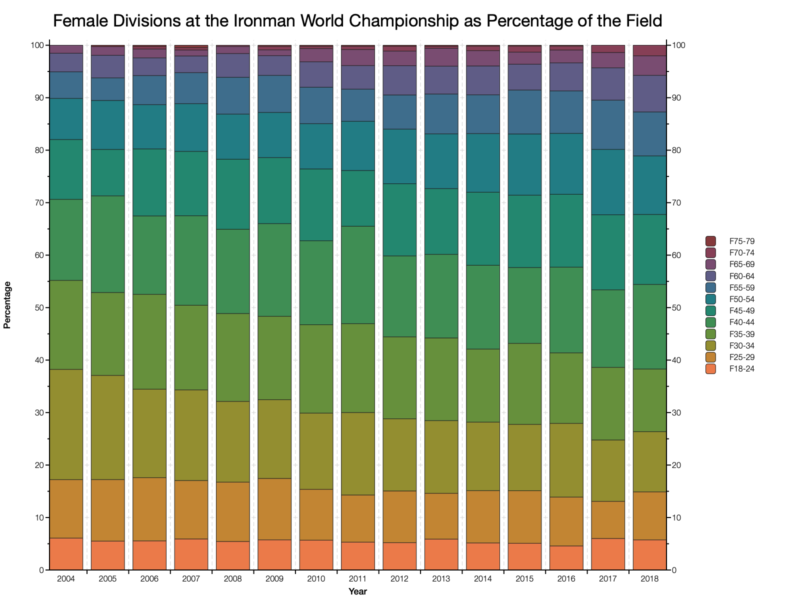 Qualification for the Ironman World Champs is by age group. The growth in athlete numbers in Kona is not evenly spread across the age divisions – some have increased more than others. Qualification slots are allocated based on athlete numbers in each category, so the patterns here aren’t fully reflective of the Ironman series. 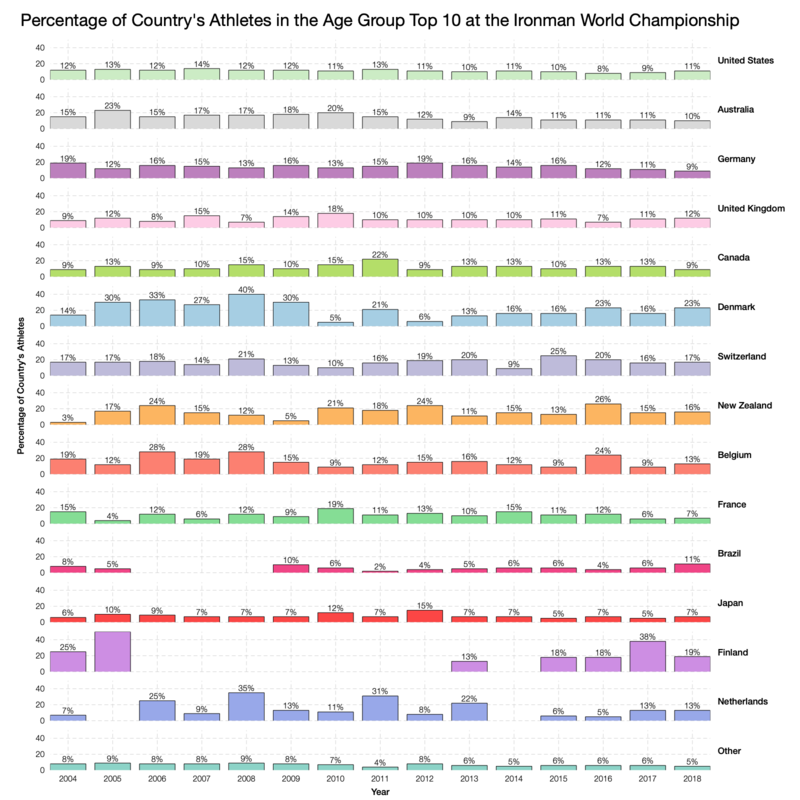 I’ve divided these charts by gender and excluded competitors over 80 to make busy graphs slightly more readable. 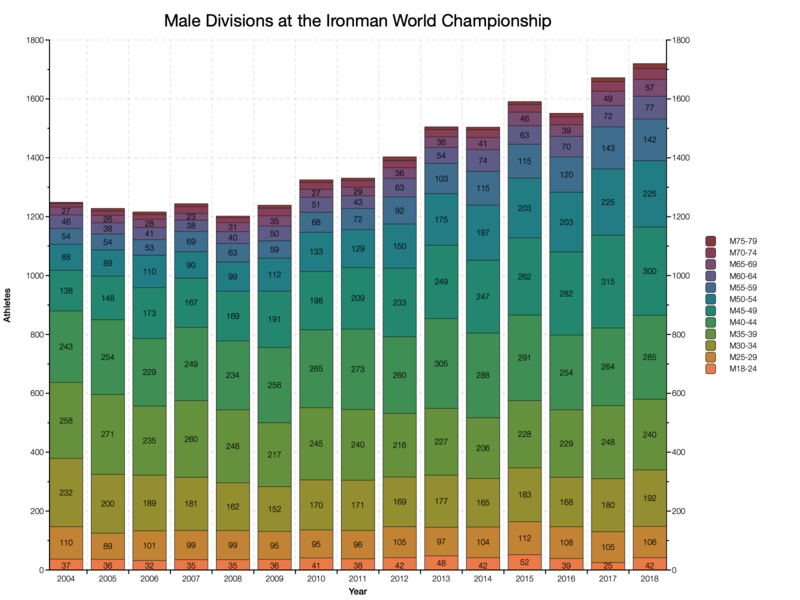 We know the number of men competing in Kona has increased and that’s shown in the above chart. Overall numbers have grown, but that growth has been focussed in the older age groups. It’s above the age of 45 where we see the most positive change. It’s clearer when we look at the percentages. Back in 2004 roughly 30% of the male field were over 45, by 2018 that has increased to 50%. Some younger age groups have declined, at least as a percentage of the field, with this being focussed in the 30-34 region. The women’s field also saw growth until a peak in 2016. This growth also appears more focussed in older age categories, with the increase happening sooner at the 40-44 age group. As a percentage the change is less extreme. Those over 45 have gone from around 30% to 45% of the field. If we broaden this to those over 40, the move is from 45% to just over 60%. Again the 30-34 age category seems to have been the most diminished during this time. The changes suggest that Ironman’s growth is more focussed among athletes over 40. 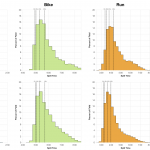 However, the process of slot allocation is also a factor in these changing age group ratios. As race numbers have increased the number of slots available at individual races has generally diminished. The exact allocation method has also changed at least once, which will account for some shift in division numbers. The final area to consider is the nationalities present in Kona. As the number of available races has grown and become more widely distributed around the world so to have the number of nationalities competing in Kona. Fifteen years ago most qualifiers were either in the US or Europe, now there are far more options available. 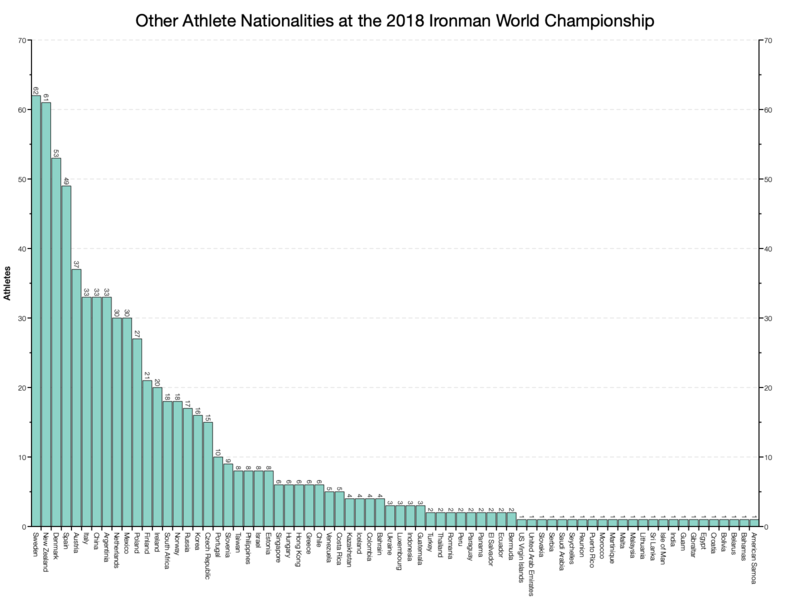 As over 80 different nationalities raced in Kona this year I’ve plotted the 10 largest in detail and grouped the rest under ‘Other’ in the above chart. This makes it easier to compare numbers for the largest ten and also see how many other athletes were present. Alongside the growth in athlete numbers there are two key changes that are easily picked out from the graph. Although they remain the single largest nation present, there has been a decrease in the number of athletes from the US. 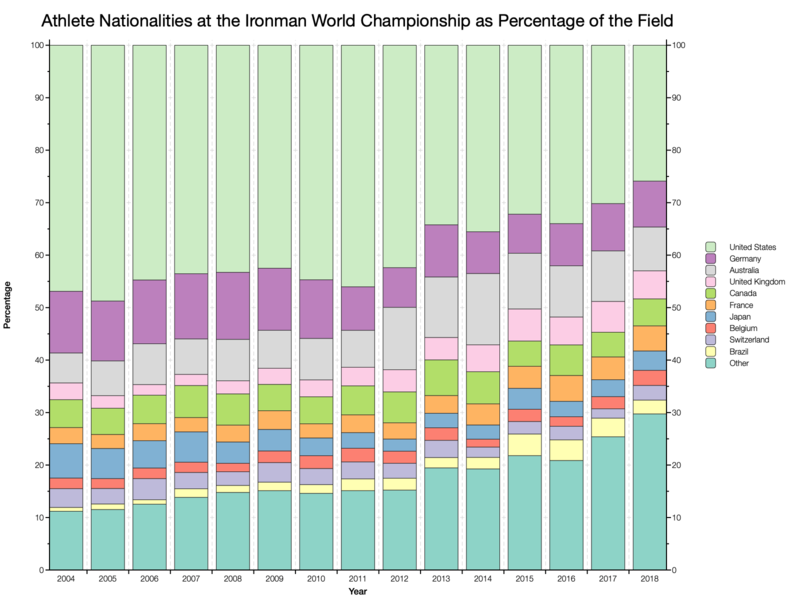 Other nationalities have grown in numbers though: twice as many Australians raced in 2018 as in 2004. The biggest increase is in that ‘Other’ category. Switching to percentages makes the changes clearer. In 2004 the US made up over 45% of the field, in 2018 they were 25%. At the other end of the chart ‘Other’ countries went from 11% to 30% over the fifteen years. While they’re too numerous to easily compare, I wanted to include a full breakdown of all the nationalities competing at the 2018 race. The chart above plots every ‘Other’ nation from 62 Swedish athletes to 1 American Samoan competitor. 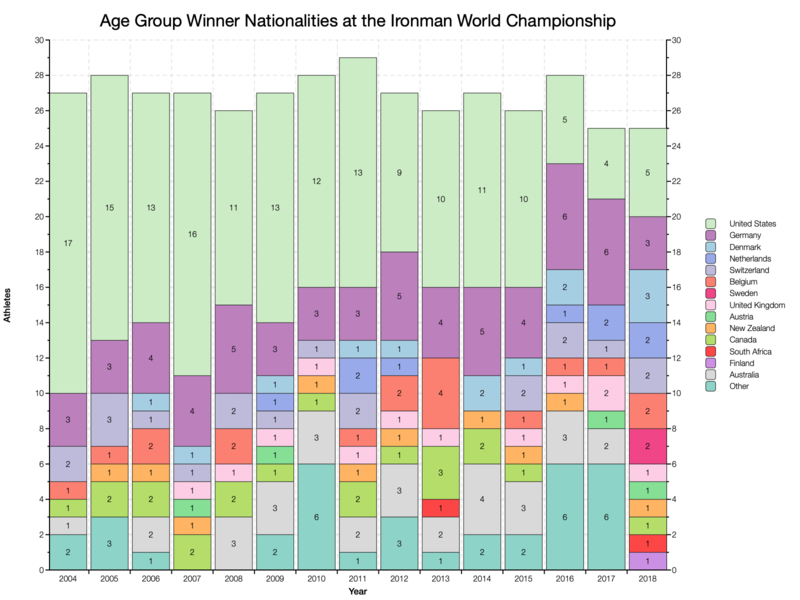 The increased range of competitor nationalities is reflected in where Kona age group winners come from. For simplicity I’ve provided details for the fifteen most successful producers of age group winners and grouped the rest into an ‘Other’ category. The number of US age group winners has declined over the fifteen years – this partly reflects the reduction in US numbers. Germany is perhaps the most consistent nation outside of the US, never failing to provide fewer than 3 age group winners. I’ve provided the percentage format of the chart. I don’t think it offers additional insight on changes, but perhaps a clearer presentation. 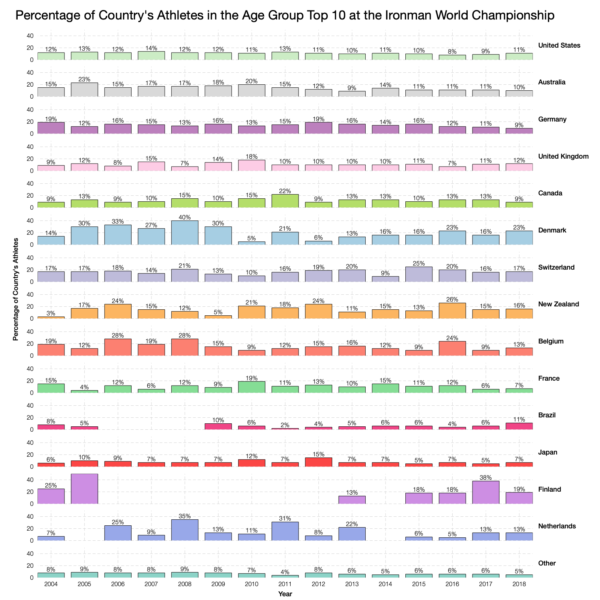 We can broaden the analysis to consider where athletes in the top 10 of their age group come from. This changes the picture. When we consider the top 10 the decline in US numbers is much smaller and the Germans have also declined. Other nationalities – such as Australia and the UK have small increases in numbers. We see a doubling for the ‘Other’ group of nationalities. Again, percentage form shows the same information; possibly more clearly. 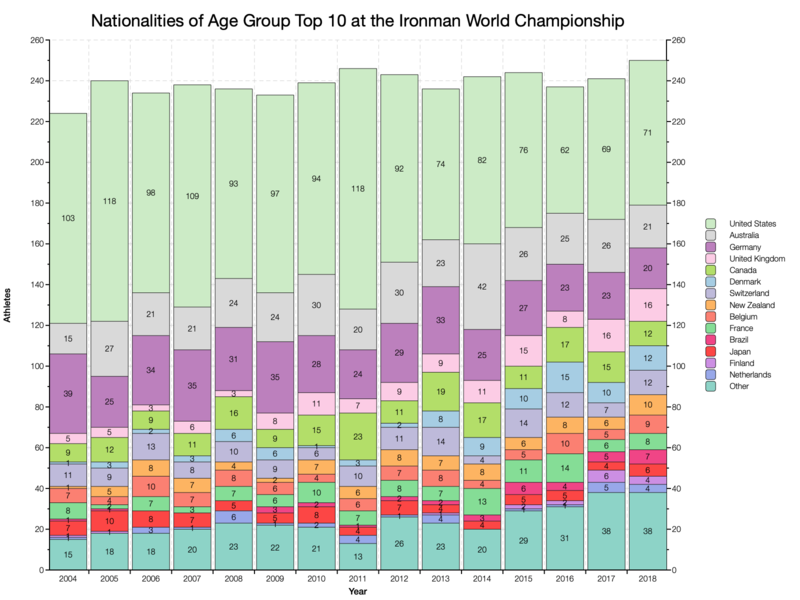 Knowing the nationalities of athletes in Kona and how many of them are in their age group top 10, the final comparison to make is the percentage of each nation’s athletes in those top tens. The higher the percentage in the above chart the bigger the proportion of a country’s athletes that made it into the top 10. Taking this view the US, UK, Germany, Australia and Canada all perform at a similar rate. 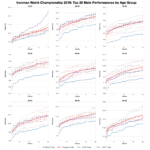 It’s countries like Denmark, Finland, Switzerland and New Zealand that appear to send fewer athletes, but get a greater proportion into the top 10. 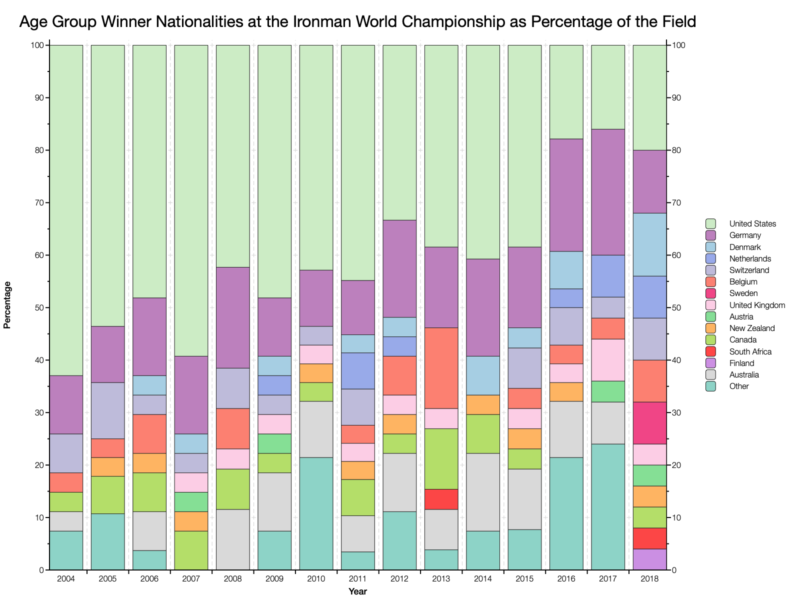 The last fifteen years of racing in Kona has seen growth in the number of athletes. This has been mostly focussed in the over 40s for both men and women. 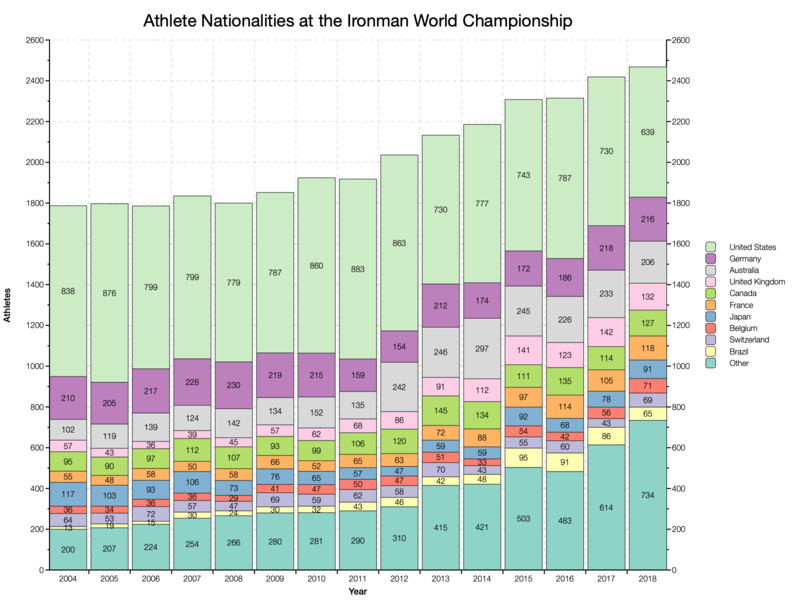 As Ironman has broaden its race portfolio into new regions this has also seen growth in the number of nationalities competing in the World Champs. 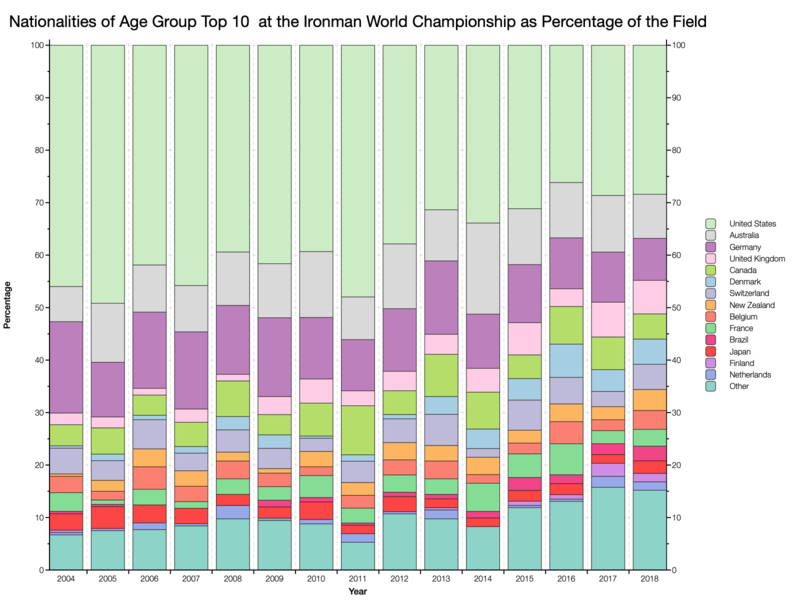 Similarly the top age group performers in Kona have diversified too. There remain a number of consistent performers who tend to top the charts though, but they aren’t always the most numerous nations.